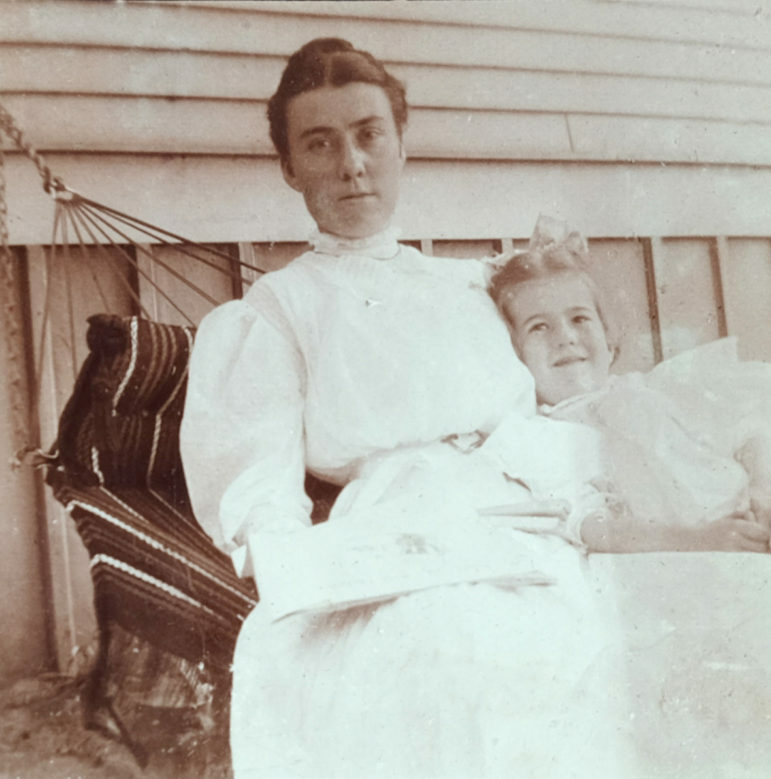 Named after her mother, Catherine (Kate) C. Sutton Thomas, Catherine A. Thomas was born in the middle of the summer in the centennial year of our nation, 1876. 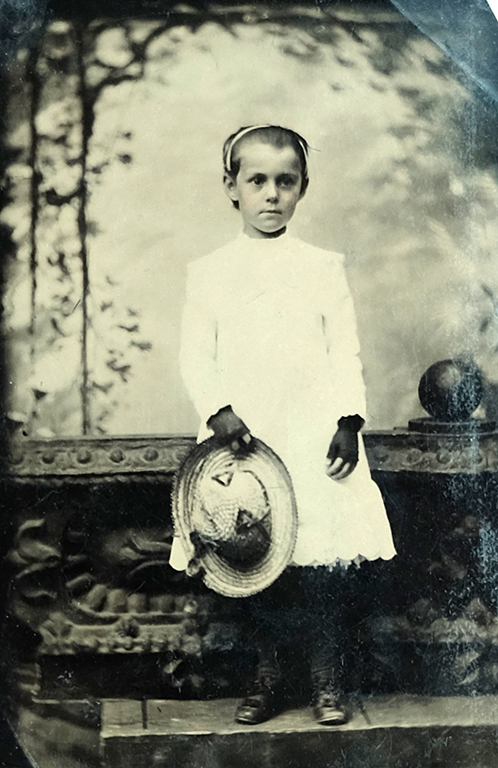 Catherine was the youngest of the four Thomas girls and the last child to be born. At some point in her early life she was nicknamed Kittie. She would be called that for the rest of her life. There is not a lot of evidence to go on but she definitely was a treasured part of the family as this post will show. 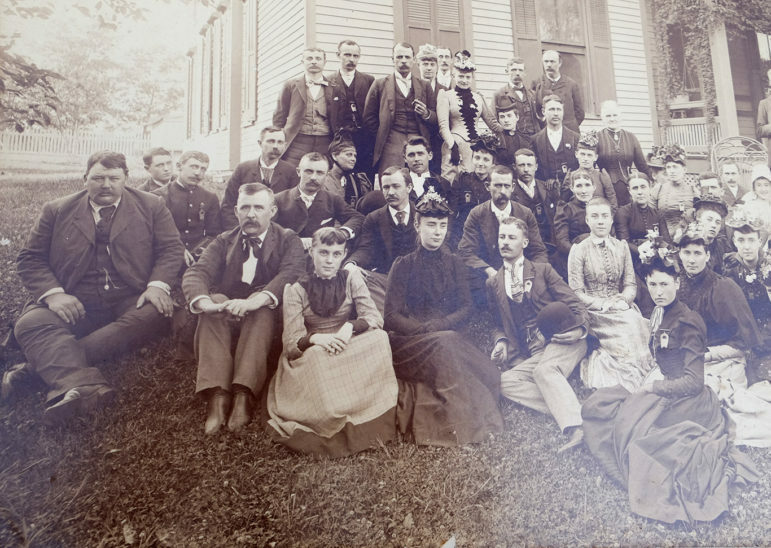 In the family group photographs she is seated either on or right next to her father. This post contains all of the photographs of Kittie that I have found in the family memorabilia. I would once again like to thank the descendants of William and Kate Thomas for sharing these very interesting artifacts from their family archive. In this image I believe that Kittie is the child sitting on the ground. After Reader Dave dissected my first photo I’ll have to admit I don’t know who these kids are. 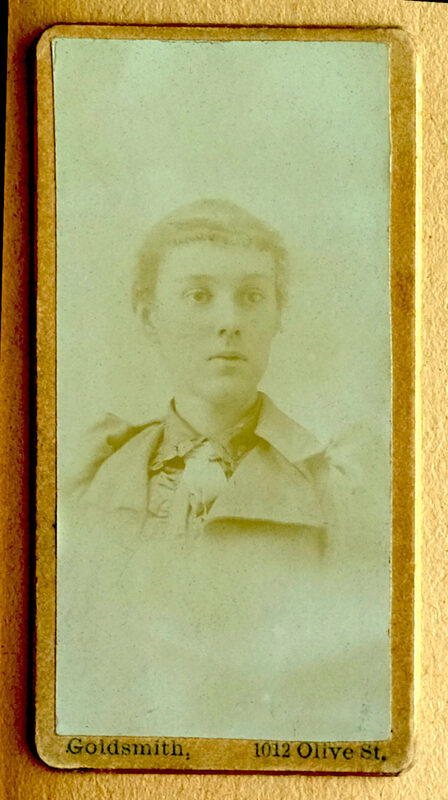 This photograph was in a frame with one of Kate that was dated 1874 on the back. Also there was a partial newspaper dated 1882 behind the mat board holding the photos. A studio shot of young Kittie. 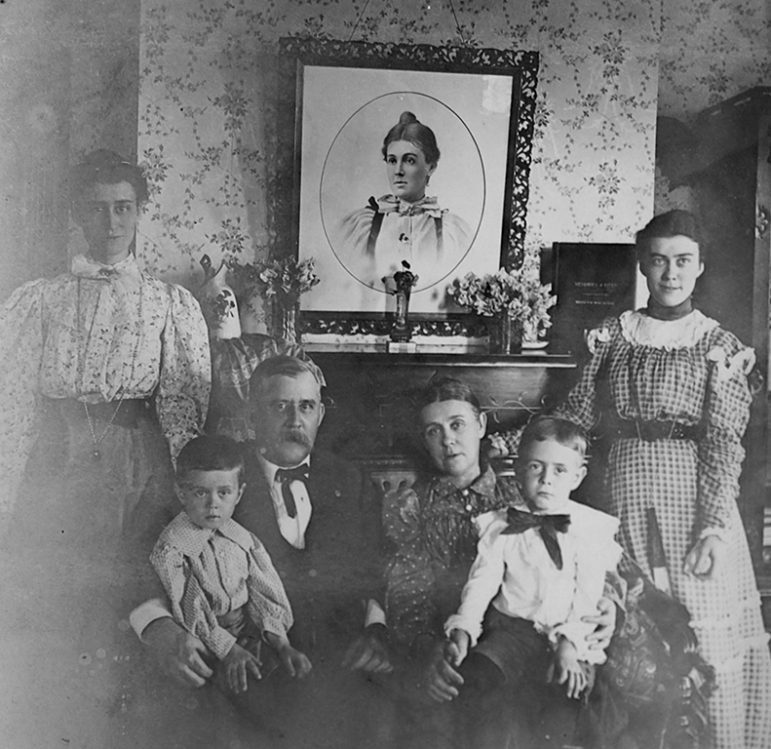 In this closeup from a photograph taken May 28, 1891, Kittie is front and center just in front of her father. I speculate that her sister Ella is just to the right of her and that her sister, Emma sits just a little farther to the right in a light colored dress. The occasion was a meeting at St. Louis of Thomas’ fellow press associates. This image was made in the front yard of Ellendale Home Place. 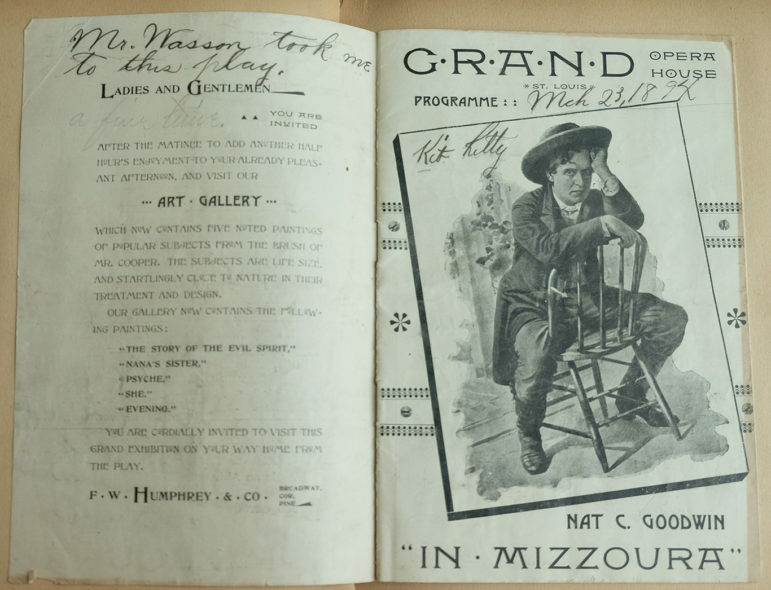 From a scrapbook of Kittie. This was in the scrapbook of Kittie. Obviously it is a poem she wrote to I’m guessing, a friend, Hazel Greene. 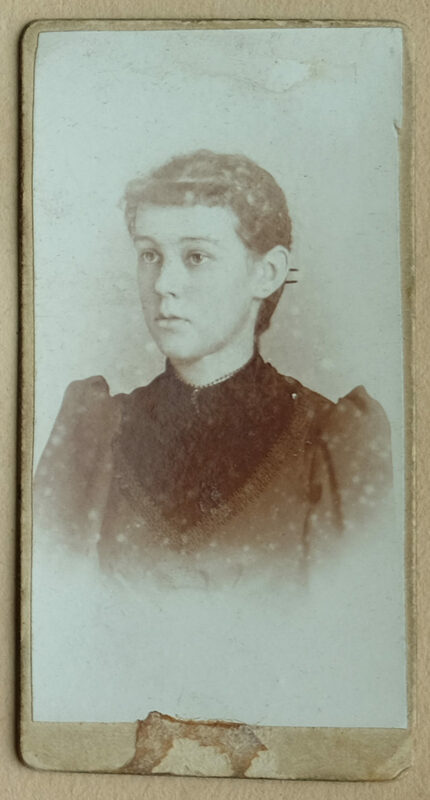 Hazel Greene shows up in another photo taken by her father A.B.Greene at the very end of the post this link will take you to. 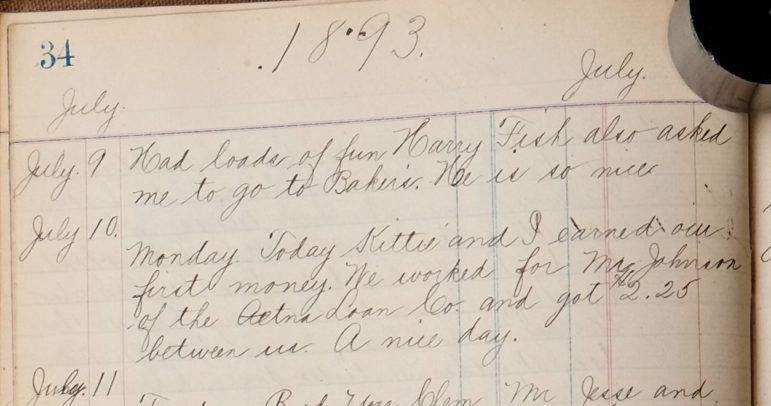 Kittie’s older sister, Emma, kept a journal in 1893 that survives today. Kittie’s name is mentioned many places throughout the journal. Here are a couple of fairly typical entries. I photographed every page of Emma’s journal and I hope to read them someday. 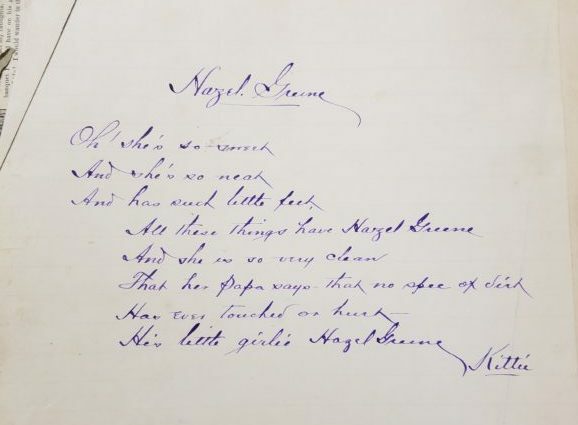 It is interesting to read of day-to-day life in our community in 1893 even if it is through the eyes of a very young woman. She writes well. An envelope from the scrapbook on Kittie. I don’t know the contents. One of Kittie’s souvenirs. I don’t know who Mr. Wasson was. Kittie was 17 years old. 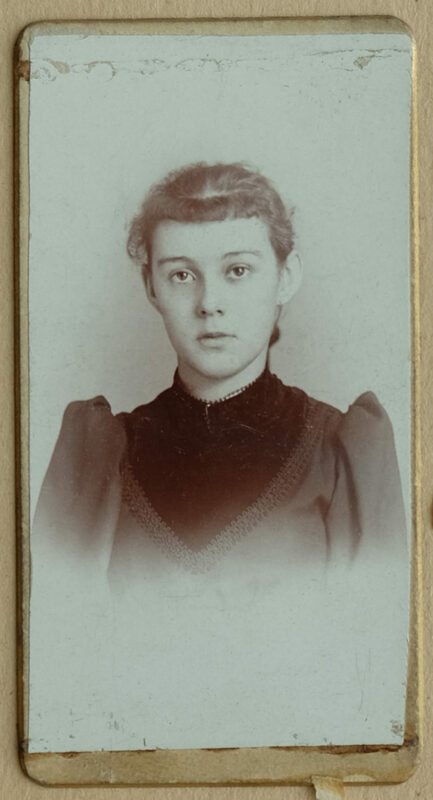 Kittie was about 17 when this photograph was taken. She was an obviously charming young woman with an interesting life from a good family. What could go wrong? Heartbreaking tragedy in October of 1896. Typhoid fever is a very painful way to die. What a shame that it should take such a promising young woman. We’d do well to remember these unpleasant details before we wax nostalgic for the good ol’ days. 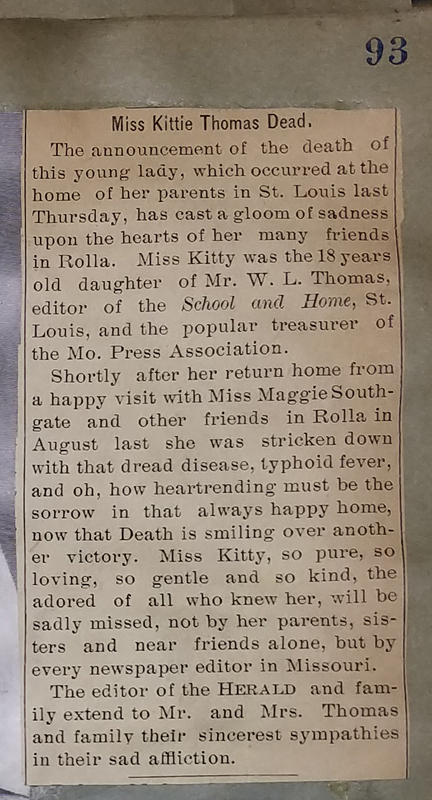 The obituary written by her father and published in his School and Home magazine. Kittie was in her 20th year. 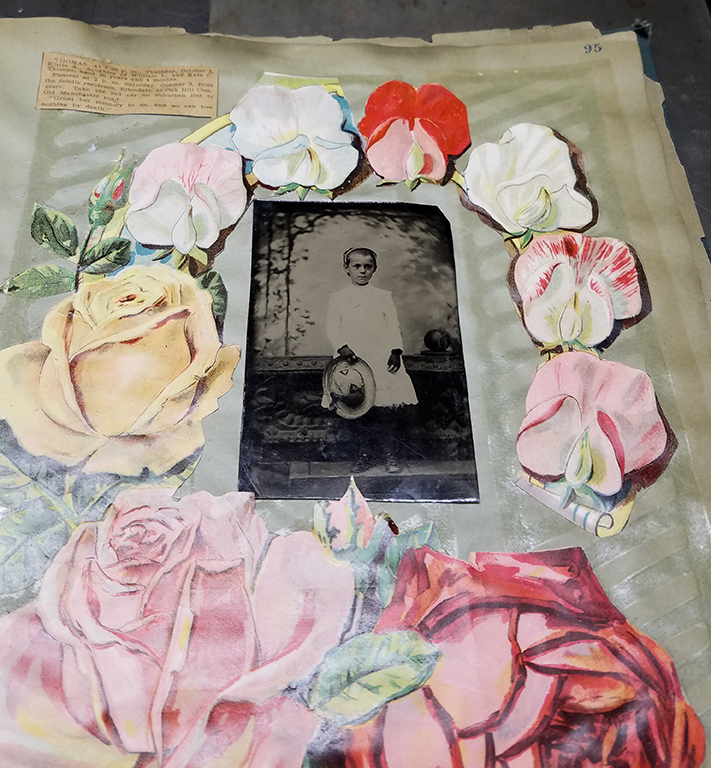 A memorial page from her mother’s scrapbook. The family was devastated. If you’ll note I attributed some of the images to a “scrapbook of Kittie.” They weren’t from a scrapbook of Kittie’s. They were from a memorial scrapbook assembled by someone in the family after her passing. That she was treasured is beyond a doubt. 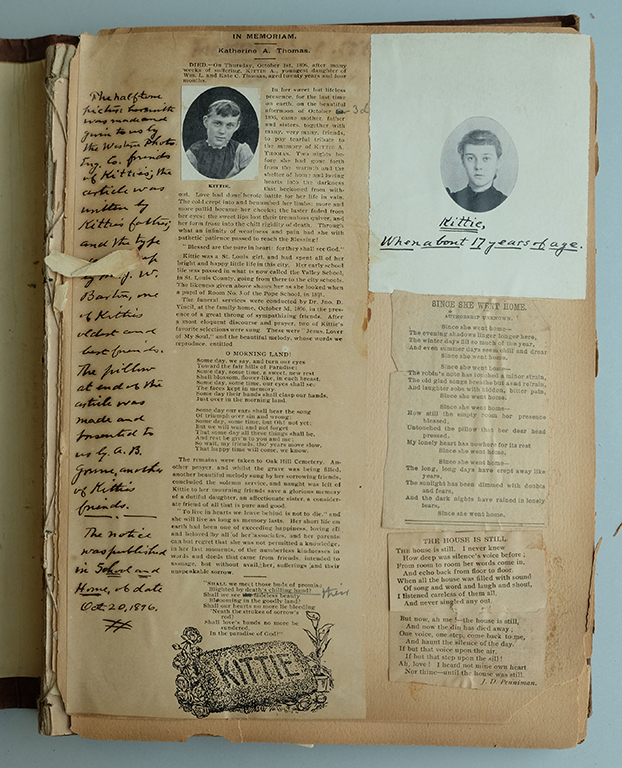 By the time this image was made on August 12, 1906, Kittie had been gone for ten years. Kittie’s older sister, Emma, had married William Grumley. They had a little girl of their own. She named her little girl Catherine. They called her Kittie. Very interesting article — and so sad. Thanks for sharing this, Doug. It truly is sad, Marianne. You are welcome. Thanks for writing. How touching, Doug. Beautiful photos. I agree with not being too nostalgic for the old days. Victorian literature is full of laments about people taken too soon. You’re a treasure, too. It’s great you serve as a method for people to share their family stories. The good ol’ days are now, Margaret. We have to keep that in mind. Just don’t watch the national news. I appreciate the compliment. Now I’m part of their family stories as well. It is an honor. I agree with you, Doug. We are fortunate to have so many vaccines that prevent diseases that used to kill people. My mom’s school-age close friend died of polio–school was shut down for two weeks and my mom came down with polio a week later– and another close friend in college died of meningitis. A little boy in 1909 buried in a family cemetery died of what started as an ear infection–his uncle who was a medical doctor couldn’t save him. Regarding people opposed to vaccinating their children I suggest they read the death records from 100 years ago. While doing my family history, I discovered that some cemeteries have a baby section because infant mortality used to be so high. We are definitely in the best time period ever. The only pining for the old days we might do should be for those we have lost. Gary, I couldn’t agree with you more. You have said it very well. Thanks for your contribution. 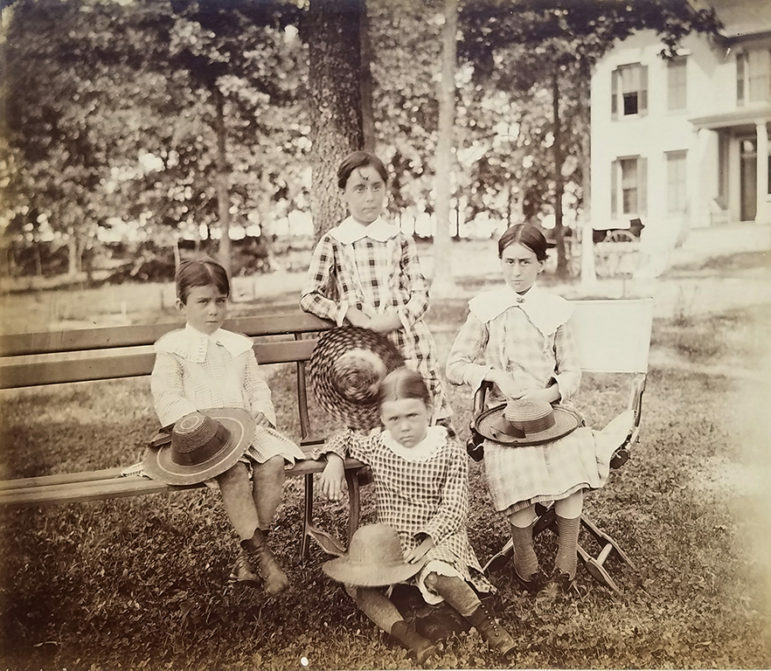 In the first photo, I believe that is two little boys on the lap of their grandparents. On William’s lap I would bet that is Frank Smith (about 4?) and on Kate’s lap I bet is Lyman Walton (about 5?). This would date the photo to about 1900, making William and Kate mid-50s, Ella about 30, and Sarah about 28 in the photo? Dave, you make a lot of sense. On the photo in question I posted your thoughts below my own which no longer hold water. I was overlooking the fact that the two small children definitely didn’t look like girls. Do you have birth dates of the Thomas children? For some reason I was thinking that Emma was older than Sarah but I went back and checked. By the order WLT listed them in his 1911 book, I had that wrong. I have a post jelling about Emma. I thought I had her image pegged because of her distinctive nose. That is why I thought the woman in the photo you identify as Sarah was Emma. She has that nose. But why shouldn’t she? They’re from the same gene pool. Looking at mother Kate’s nose, they might have gotten it from her side of the family. 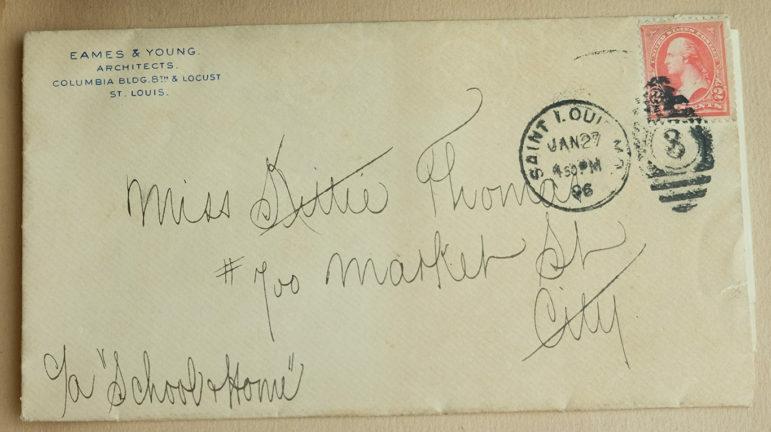 The last image in this post has just the date on the back, August 12, 1906. Emma and William Grumley were married on June 28, 1899. Her daughter was born a year or two later. WLT writing in his 1911 book again says they had a ten year old daughter, Kittie. That and the nose are what I’m going on. Much thanks for your input. I ought to send this stuff by you before I publish it.